However it surely is not as appealing as the MacBook Air when it comes to looks and design. In terms of slimness, X300 is slim enough. Now for the differences. Firstly the X300 ships with the Microsoft Windows Vista operating system whereas the Air comes with Apple’s Mac OS X 10.5 Leopard. That is a major difference. Vista really has not set the community ablaze with its greatness whereas the Mac OS has definitely earned some rave reviews. Well we really cannot blame Lenovo for this since they do not control Microsoft’s OS business. 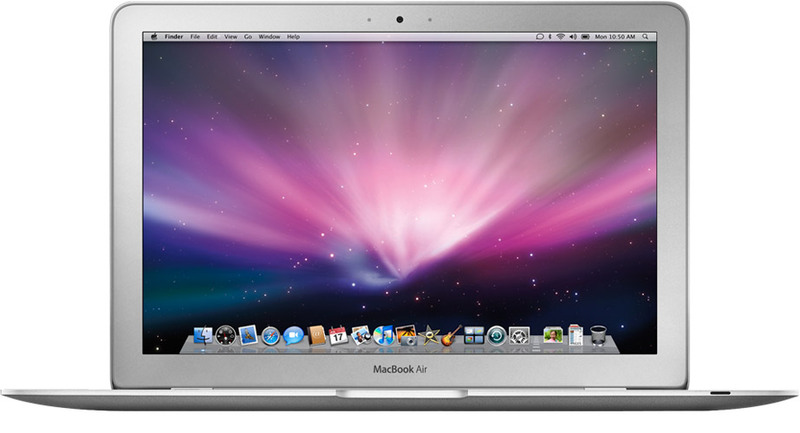 The Air has a standard 1.6GHz Intel Core 2 Duo processor with the option of upgrading to a 1.8GHz one. The X300 disappoints in this regard as it offers only a 1.2 GHz version of the Core 2 Duo from Intel. Though this difference in speed would hardly be discernable to most users, the Air might have an edge when it comes to running CPU intensive jobs. 2GB DDR2 SDRAM is standard on the MacBook Air whereas the X300 comes equipped with only 1GB of the same. This is another disappointment. Windows Vista hardly performs with 1GB of RAM. Lenovo should definitely take a look at shipping with 2GB as standard on its machines. On the wireless front, the Lenovo has built-in support for 802.11 a/b/g/n whereas the Air supports only 802.11 a/b/g. Again this hardly makes much of a difference on most of the wireless networks available today. Then again the Lenovo does have the latest. The biggest disappointment with the Lenovo lies in the hard drive. The X300 ships with a 64 GB solid state device and does not offer any option of using a traditional drive at all. The Air on the other hand provides more space with the standard 80GB parallel ATA hard drive. Of course you can also opt for a 64 GB solid state device on the Mac at an additional cost. In the display the Lenovo does offer a better highest resolution. The X300 supports 1440×900 whereas the Air stops at 1280×800. Where the Mac deparately falls short is in the peripheral connectivity and optical drive systems. The Mac offers a single Micro DVI, 1 USB 2.0 and an audio out port and no DVD drive. That is just not enough. The Lenovo does much better in this regards. It offers 3 USB ports, one headphone port, a line-out port, a microphone/line-in port, a Gigabit Ethernet port and an external display port. Thats a lot when it comes to its small package. The Lenovo also offers a few WAN choices including one that has GPS funtionality. Wow! That would be a good one to have for the people on the go. The Air does not offer anything like that. The Lenovo X300 can weigh between 2.93 lb to 3.51 lb with the different options whereas the Mac Air wieghts around 3 lb. Well the Lenovo does offer more options. So which one to choose? The answer is very clear if you have a preference for a certain operating system. If not then a more careful consideration would be needed. Performance wise both should be performing near to each other. If you need more connectivity the Lenovo X300 seems to be the one. If you need more storage space and can live without all the USB ports and a DVD drive then the Mac Air will suffice. And if you need just the coolness then both would do though personally I find the Air better in this matter.